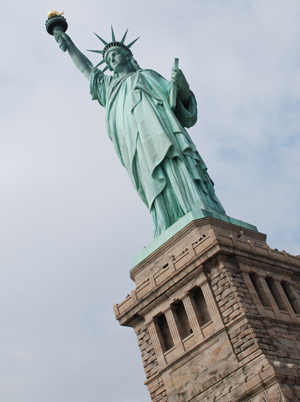 Just for cleaning up the Statue of Liberty in New York local engineers worked out the technology of soda blasting. The technology is totally different from the techniques used in cleaning and ripping different objects. Soda blasting is the use of special tool to transfer the dry or wet soda on the dirty surface under high pressure but low tension. While contacting the cleaned surface the soda crystals explode or blast. The energy generated rips the dirt or the paint without damaging the cleaned surface. The most well-known spraying technique is sandblasting, that works on the principle of scratching – sand granules are splayed at high speed against the surface needing ripping. Sand granules do not explode but are able to break everything in its way. The second well-known method is pressurised washing, when different chemicals are used as the cleaning element. Thus, the main difference while comparing with the rest of the technologies is that the first does not break the under surface. It is well known fact that while using sand spray hole may easily occur in the surface. It is practically impossible to use sand spray to clean up a log house. The fragility of soda blasting is expressed by the fact that the same technology is used by dentists to white up the teeth.